A Robins and Day Citroen dealership has been severely damaged by an arson attack which tore through the main showroom and workshop – causing an estimated £100,000 worth of damage. Seven showroom vehicles were damaged along with additional vehicles in the workshop and extensive damage was caused to the fabric of the facility in Small Heath, Birmingham, after fire broke out at around 9pm last night (January 16th). Around 40 firefighters tackled the blaze and police arrested a 33-year-old man on suspicion of arson, the Birmingham Post reported. This morning a lane had to be closed on the A45 ring road that loops the showroom as the clean-up got underway. 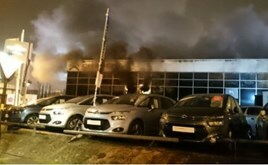 A spokesman for West Midlands Police said: “We were alerted by fire service colleagues at 9.10pm last night to a fire at the Citroen car dealership in Small Heath Highway. “One lane of the highway remains closed while fire investigators and forensic examiners assess the scene. Speaking to the Birmingham Post, Highgate Fire Crew commander Mark Clifton said that his team had responded to the blaze within four minutes but confirmed that the building had been “deemed unsafe” as a result of the fire. Robins and Day are redirecting customers to nearby dealerships in Digbeth and Redditch.